Profile: It is matte, opaque, co-extruded, Both side corona treated, non-heat sealable BOPP film. High Shrink is Mono-Axially oriented Co-Polyester based film with more shrinkage in transverse direction. The film is coated for better frictional & handling properties. 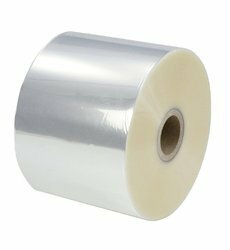 This film is specially designed for outer wrapping & labeling of PET & Glass bottles, Cans and various other kind of containers with complex shapes in form of sleeves & cap seal stock. The company’s has broken new ground with an exceptional line of labeling films. The features of each film exceed industry standards in all aspects of composition and performance. The films shelf appeal and offer a cost advantage in the labeling of bottles, jars and other packaging containers. It is a co-extruded, one side pearl, other side silky matte and both sides corona treated cavitated white opaque Bi-axially Oriented Polypropylene film. Most of the well-known beverage brands use our films for their wrap around label needs. We offer films for reel fed as well as cut & stack application. - Polyester Release Liner offers superior tensile strength, dimensional stability and caliper control. - Suitable for different label stock construction and compliment well with wide variety of 'Face' materials like Paper, PP, PET and PE. 70 μm soft-PVC, glossy, crystal-clear, high initial adhesion, pre- cut labels on rolls. Most of the well-known beverage brands use our wrap films for their wrap around label needs. We offer films for reel fed as well as cut & stack application. it is a co-extruded, plain and one side corona treated bi-axially oriented polypropylene film.